San Carlos Borremeo de Carmelo, otherwise known today as the Carmel Mission, was founded by Fr. Serra in 1770. Its appealing mix of history, architecture and setting make its location in the Carmel River Valley one of the most frequented sites in California. From his headquarters here, Serra managed the growing mission chain which numbered nine units and supervised the baptism of 5,307 Indians before his death. 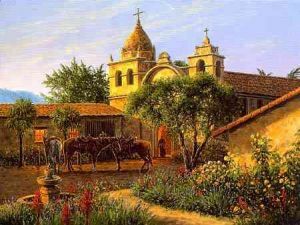 An elegant fountain, olive trees and attractive gardens enhance the site where visitors tied their horses and entered the mission. The reflection of the setting sun upon the church silhouettes the Padre in the arched entrance as he makes his way back to his modest room carrying a bouquet from "The Padre's Garden."